Bob Turnbull born 22 June – Arsenal’s record scorer. Robert Hamilton “Bob” Turnbull was born on the 1st anniversary of the foundation of Woolwich Arsenal (well, the anniversary of their first ever AGM) on 22 June 1893. He had a military training with the Royal Corps of Signals, and played initially for the Royal Engineers AFC – a club with a most illustrious history, having won the FA Cup, appeared in four of the first eight finals, become the first team to go on tour, and who were the team that pioneered the passing game (known in the 19th century as the combination game). He joined Arsenal in 1921 as an amateur playing under Leslie Knighton as left back, playing his first game on 27 December 1921 in a game that had Joe Shaw at right back and with a crowd recorded as 37,000. That Arsenal lost was not surprising as they had not won in their last five matches, and the team was a typical Knighton mish-mash with Milne also making his début and Dr Paterson making his first appearance of the season. Bob Turnbull played five games that season – including one at centre forward, for the final match of the season against Bradford City – Arsenal winning 1-0. In the following season after eight games at full back he then played 27 consecutive games at centre forward scoring 20 goals, helping to lift Arsenal to 11th in the league – a remarkable achievement since Arsenal won only five of the first 22 games in the league that season. Indeed everything turned round that year when Bob Turnbull scored four on Boxing Day in a 5-0 win over Bolton at Highbury. It was only the second win since mid-October.The use of Bob as a centre forward was Knighton’s third throw of the dice regarding the number 9, having tried Young and Roe in that position in the first part of the season. The 22 goals he scored in league and FA Cup that season was at that time a record for an Arsenal player. But in 1923/4 with only three goals in the opening 10 games he was replaced as the Knighton merry-go-round continued. After making just one appearance in 1924/5 on October 18 1924 against Villa, he was put on the transfer list and sold to Charlton Athletic in November. He then went to Chelsea where he scored 58 goals in 87 first team games. He then moved on to Clapton Orient, Southend Utd, and Chatham before moving to Crystal Palace as first a player and then a trainer. He was still with the club when he died in 1946 aged 52.Quite how one player could have such incredible form for one season at Arsenal, then lose it, and then find it again, I certainly don’t know, but I wonder if it was not more than a case of form. Niggling injuries in the early 20th century would not have received the attention that they get today, and I suspect many players played on (either to keep getting their playing bonus or because the manager pushed them to play) when still carrying an injury. That to me makes more sense than form coming and going in such a dramatic way. —Just a final thought concerning the day I write this (22 June 2013). 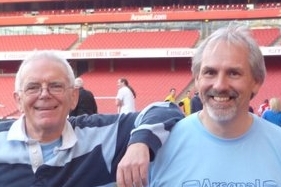 Talk Sport are doing a radio programme at 10pm tonight to which the Arsenal History Society has contributed.